Last week, my work colleagues organised some kind of dinner gathering along with the breakfasting moments. All of the people who attend have to bring food to share. So I decided to bring Bitter Ballen, which is a savory dish which is best for appetizers. I posted the pictures of my "masterpiece" on my Path account and I received many feedback from my friends who wanted the recipe for the Bitter Ballen I made. Well, here are the recipe for my version of the Bitter Ballen. Heat up the pan in medium hear. Put butter, then chops of onions and garlic. Stir well until half cooked. Put the carrots, potato, and meat. Stir well until the meat changes its color. Then add pepper. Add the milk. Stir until the milk boils a little. Add the cheese. Stir until all the cheese is melted. Then, taste it. The salty taste will depends on the type and the quality of the cheddar cheese you use. If it is not salty enough, then add salt. When the taste is already nice, add the Plain Flour little by little. Stir until it forms like a soft dough texture. Turn of the heat, wait until it cools down a little. Then, shape the dough into small ball shape. I use a cookie scoop so that all of my dough are shaped in the same size. Dip the ball into the whisked eggs. Then dip into the bread crumbs. Deep fry it until it is golden brown. To garnish it, you can put the balls into small chocolate cups and poke it with a piece of chilly like I do (shown in the picture). Or, if small hot chilly is not your thing, you can put small cut of fresh parsley as a decorative garnish for your Bitter Ballen. Whichever way is awesomely beautifoe!!! Now I know this is far from the authentic version of the Bitter Ballen. This is just a simple version of how I make my Bitter Ballen. However, it is a great snack and a lot of people like it very much. 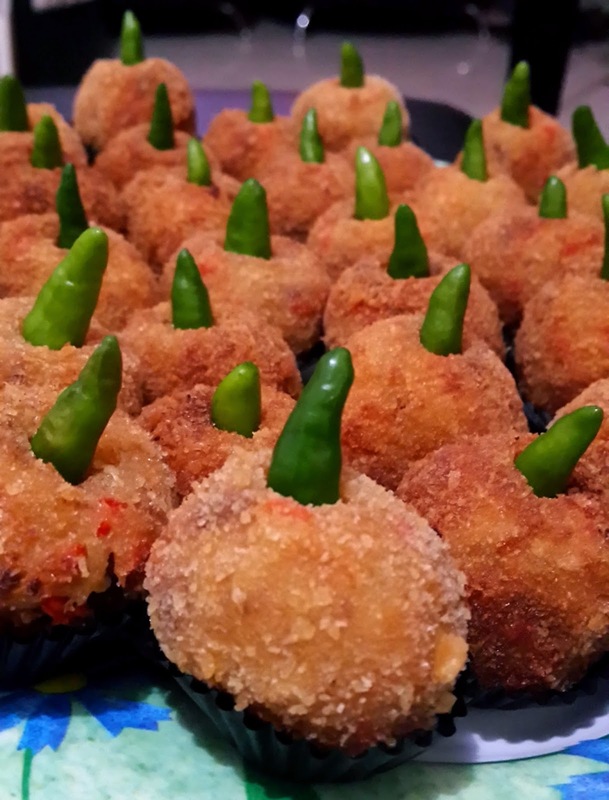 It is also great for parties where you want to serve your guests with finger sized snacks that looks amazing. @Mba Siwi: Yups... Apalagi kalo pake Keju yang di UK.. Makin maknyuuusss..